There are several sources of timber decay that are present throughout properties in the UK. In our experience of providing industry leading dry rot treatment, wet rot treatment, and woodworm treatment – many property owners were unaware their property had suffered from timber decay. With little or no damp proofing, timber is extremely vulnerable to the likes of penetrating damp and rising damp if left untreated for prolonged periods. Regularly inspecting and maintaining your property can prevent various types of dry rot and wet rot from causing timber decay. To find out more about our industry leading woodworm treatment, call us today on 01793 272085. Alternatively, you can explore our woodworm treatment fact file. Below is a short guide to identifying sources of woodworm, dry rot, and wet rot – and some practices you can implement to prevent such damage to your timber. Unfortunately, there are various types of insects that also use timber for their homes. The most common insect that can be found within timber in the home is the woodworm. 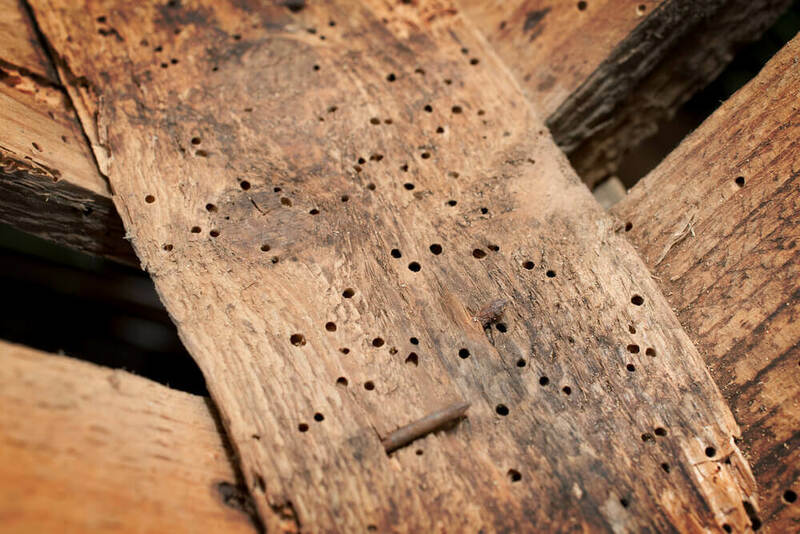 Woodworm is a generic term given to a range of wood-boring insects that can be found most commonly in structural timbers, wood roofing, flooring, and joists. Without regular inspection or any timber treatment, woodworm can result in the irreversible structural damage to your home. Many home buyers conduct pre-purchase reports with woodworm surveys as the damage that can be caused by woodworm can be extremely damaging. Woodworm larvae can live in timber for several years, consuming large amounts of timber before pupating. At this stage, the adult woodworm emerges from the wood and leave behind ‘frass trails’ and large emergence holes. Commonly found it softwoods, the woodworm requires a certain level of moisture to survive, making it essential to damp proof your home. The average woodworm larvae live in timber for 3-5 years and eat their way through the soft, moist timber that has been affected by potential rising damp or penetrating damp. When the woodworm emerges, a small trail of finely chewed wood (frass) is left behind and looks a little like sawdust. This is a key indicator that your timber may have woodworm. Woodworm treatment will require a specialist timber survey to measure the type of woodworm present and the extent of the damage to the timber. The main woodworm treatment is a coarse spray that will preserve the timber and prevent future woodworm from eating away at the structure. As one of the most serious types of timber decay, dry rot is caused by a devastating fungus. Forming on timber with a moisture content above 30%, the fungus can grow at an accelerated rate. Dry rot can cause severe damage to your structural timber so getting effective dry rot treatment is important. Dry rot treatment requires careful planning and execution, and identifying the dry rot outbreak is essential in treating it effectively. In its early stages, dry rot festers beneath floorboards and behind timber paneling, hidden away from the human eye. 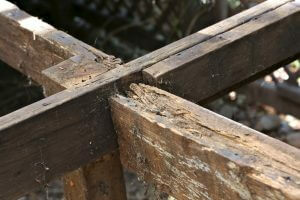 You can, however, spot certain characteristics of dry rot as timber is softer and can often shrink slightly. When timber has been exposed to dry rot for a prolonged period, it is much lighter and can fall apart in your hand. Dry rot tends to have a distinctive mushroom odor compared to the regular woody smell of timber. Dry rot has the ability to spread across timber, and dry rot fungus can grow on the surface of bricks and plaster, making it essential to catch early on. In it’s most suitable conditions, dry rot can grow several metres from its initial source. Whilst dry rot has limited growth after its food source is depleted, it can spread and grow into areas where fresh timber is present. Maintaining moisture free timber in properties is essential when preventing dry rot and wet rot. There are some simple steps that can be carried out to keep your home damp free which can be found in our damp proofing article. If you think that your timber may have woodworm or dry rot, Biocraft South West are experienced in providing woodworm treatments throughout the Southwest. We use specialist preservatives that have custom formulas depending on the type of woodworm or dry rot present in your property. You can call our team of timber treatment specialists today on 01793 272085 to book an initial woodworm survey or dry rot survey. You can also visit our woodworm treatment specialists page for more information.